2nd Thursday of each month @ 6 PM – Come for a different craft workshop every month! Crafts are focusing on jewelry currently – from scrabble tile pendants to wire wrapping to hardware bracelets with metal stamping! Registration is required (so we can be sure to have enough supplies) but the workshops are free! Sign up in the computer room, by calling in, or on the Facebook Event for this month’s craft! 2nd Wednesday of each month @ 12. 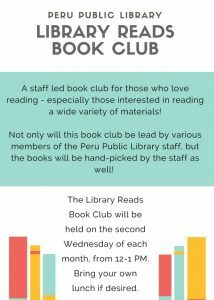 A staff led book club that meets over the lunch hour. Bring your lunch and discuss a new book each month (even if you haven’t finished it yet, we’d love to have you! )!